There’s nothing better on a cold winter day than a bowl of warm soup. Whip up a batch of this spicy-sweet Creamy Carrot Soup with Warming Spices and you’ll have plenty to share with family and friends. It’s definitely “soup season” out there. The cold weather of soup season calls for warm foods, preferably warm foods made even warmer with ingredients that have a warming effect on the body. Some spices, such as ginger, cumin, cinnamon, cardamom, saffron, cayenne, and allspice, don’t just have a warm flavor — they’re known to actually help raise the body’s temperature. That warming effect is greatly appreciated when it’s chilly outside! Creamy Carrot Soup with Warming Spices contains four of these pleasantly warming spices: ginger, cumin, cinnamon, and allspice. It’s a wonderful soup recipe that you’ll likely find yourself making more than once this “soup season”! This is a very filling soup. The heavy whipping cream in this soup makes for a very filling soup. 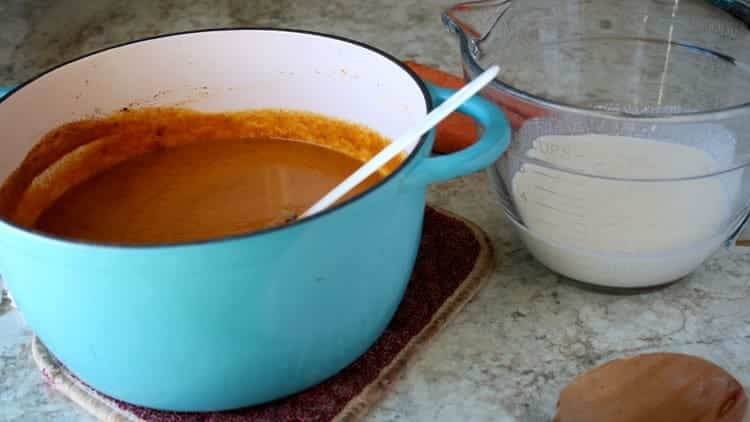 If your idea of a healthy carrot soup recipe is a recipe that is a little more veggie-heavy than fat-heavy, use a lighter liquid instead of the whipping cream. This creamy soup can be made into a vegan carrot soup with coconut milk. The standard recipe calls for 1 1/2 cups of whipping cream — not exactly vegan. However, you can easily substitute the whipping cream with an equal amount of full-fat coconut milk. Make sure you get canned coconut milk if you want a rich soup. Coconut milk from a carton or bottle can be used, although you’ll get a thinner, less filling soup. For something different, try it chilled. Although this is a warming soup with ginger, cinnamon, cumin, and allspice, you can also serve it chilled in the warmer months. I think it’s best served warm, but try it cold and see what you think! 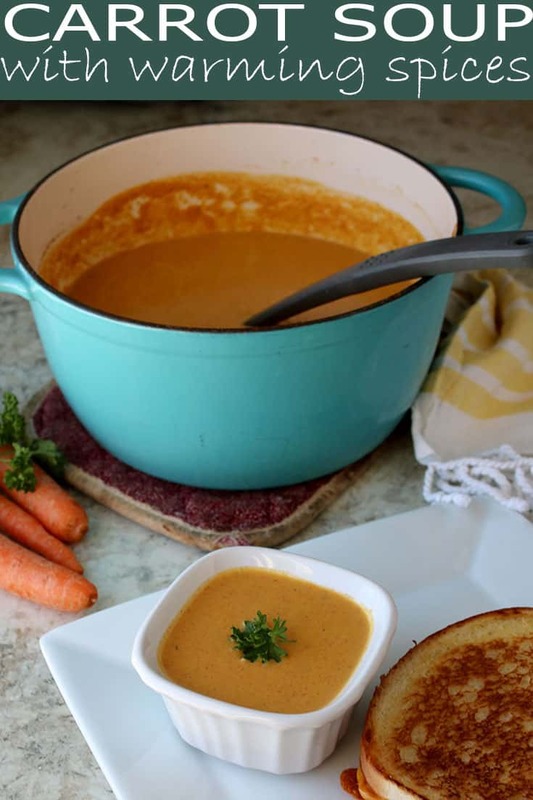 If you like this creamy carrot soup, you’ll love simple roasted carrots. If you snag a roasted carrot from the baking sheet before you make your soup (no judgment here) and you find yourself craving more, try my Super Easy Tri-Color Roasted Carrots recipe. Roasted carrots are so easy to make and such a treat, especially in the winter months when you’re craving hearty, filling vegetables. Step #1: Peel and chop carrots for soup. 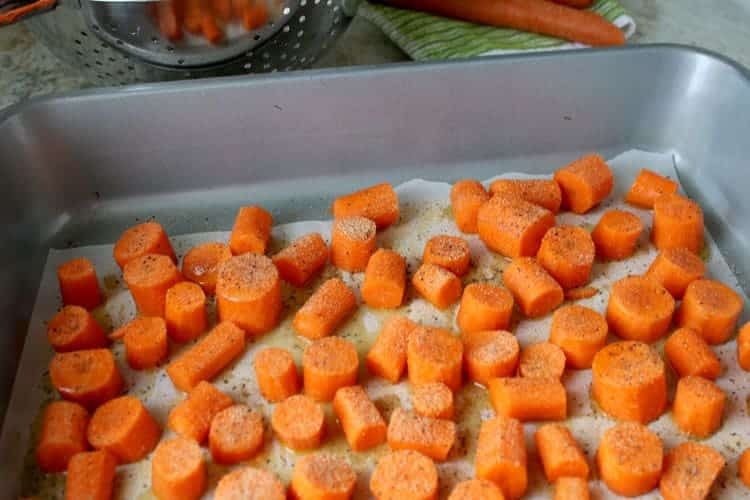 Step #2: Arrange carrots on a sheet pan with high sides or in a roasting pan on a silicon baking mat or parchment paper. 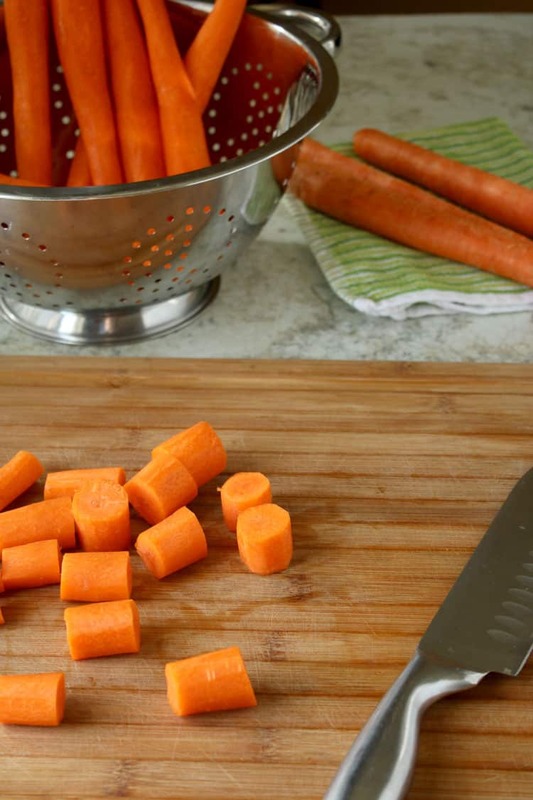 Drizzle olive oil over the carrots and turn each carrot to coat evenly with oil. Sprinkle seasonings evenly over the carrots before putting the pan in the oven to roast the carrots. Step #3: Roast carrots for 20-25 minutes before removing from the oven to turn the carrots over. 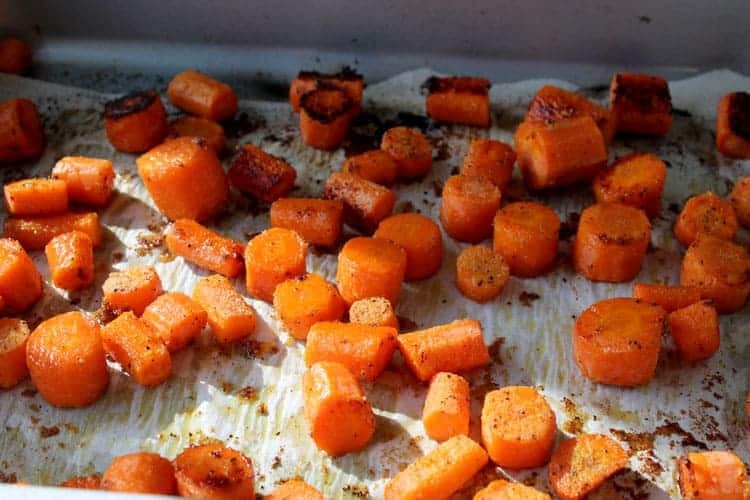 After you’ve flipped the carrots, return to the oven and roast carrots for an additional 10-15 minutes. 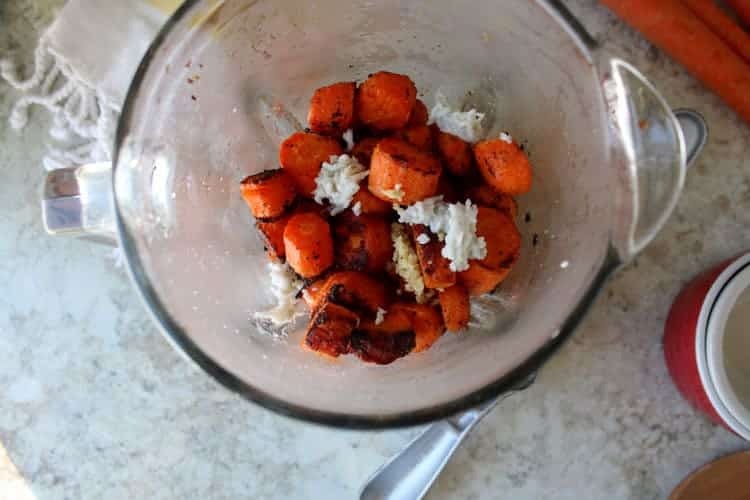 Step #4: Using tongs, pick up the carrot chunks and place them in a blender or food processor. Add grated garlic and chopped or pressed garlic. To save time, we used jarred garlic cloves that we had on hand and pressed them with a garlic presser. Add half of the vegetable stock (2 1/2 cups), and then put the lid on and process until smooth. 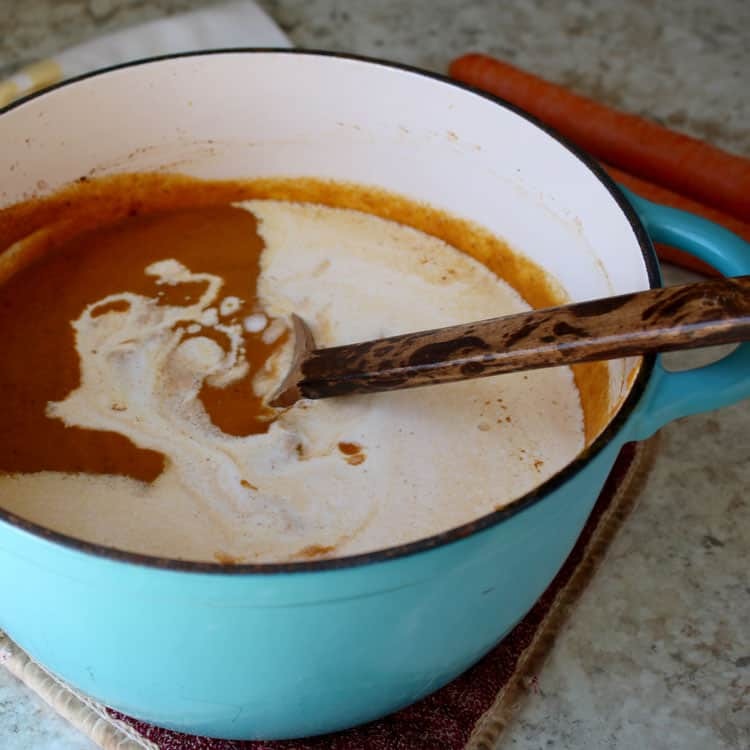 Step #5: Pour the smooth and creamy carrot soup into a large pot, and then add heavy cream and stir until it is completely incorporated. Step #6: Heat on stove-top over medium low heat until soup is heated through. Dish up and serve on its own or with a sandwich. 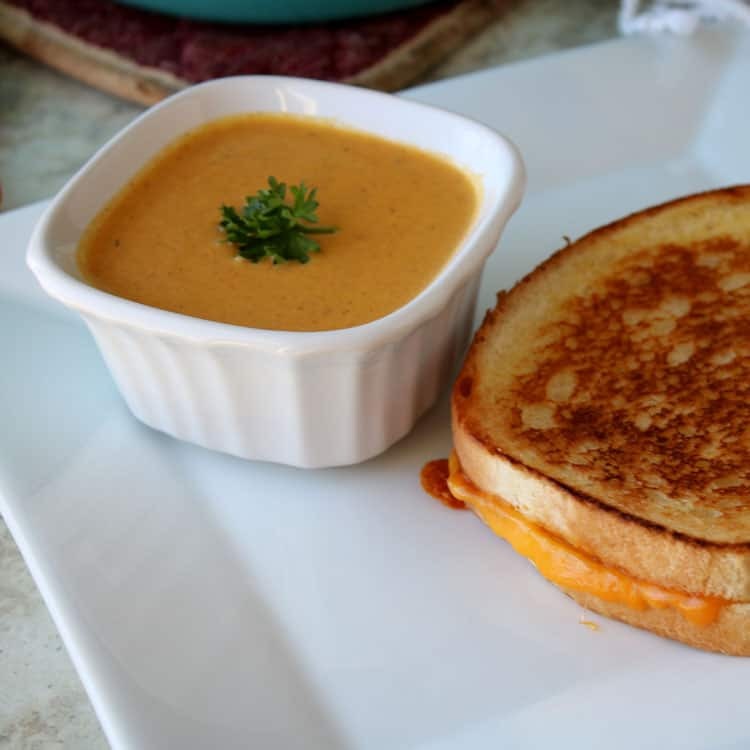 Our gourmet grilled cheese sandwich is phenomenal served with a side of soup. 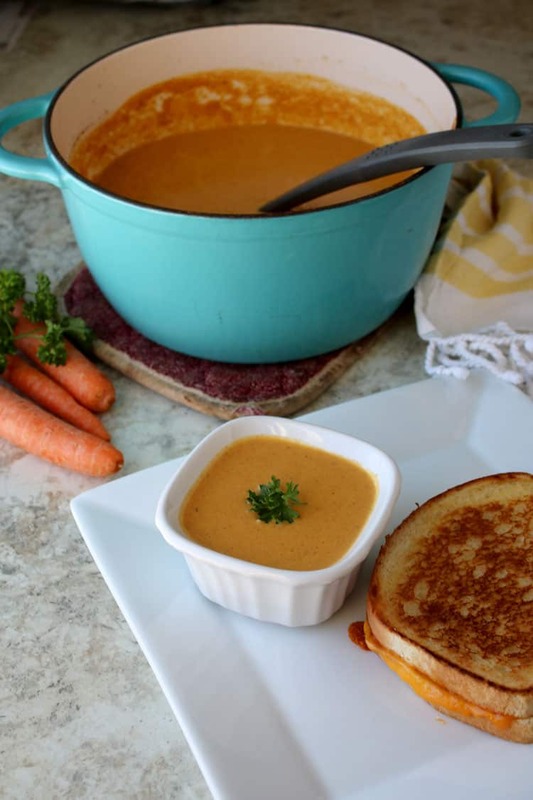 I hope you enjoy Creamy Carrot Soup with Warming Spices. Although I love chilis and stews this time of year, there’s nothing quite like a bowl of comforting, creamy soup! This roasted carrot soup with warming ginger and spices is a wonderful soup for a cold winter day. Preheat oven to 450 degrees. Take a large rimmed baking sheet and line it with parchment paper or spray it with non-stick cooking spray. 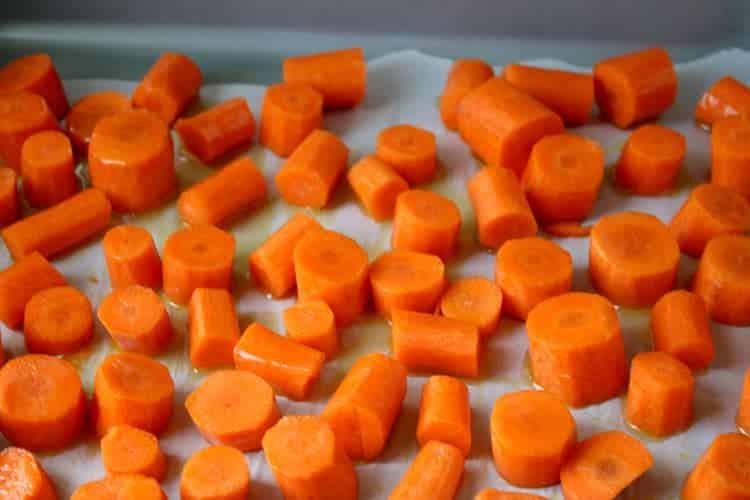 Add carrots to a baking sheet in a single layer (don’t let carrots touch) and drizzle them with olive oil. Using your fingers, spread the olive oil on the carrots so the exposed portion of each carrot is evenly coated with olive oil. Sprinkle salt, pepper, and garlic powder (optional) evenly across the carrots. Roast for 20-25 minutes before turning the carrots over. Roast for an additional 10-15 minutes, or until the carrots have a nicely brown color and are fork tender. Remove from oven and cool. 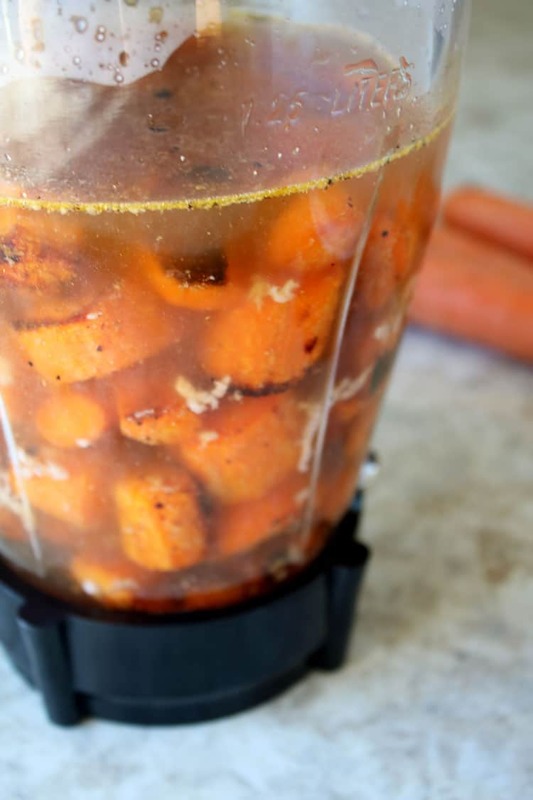 When the carrots are cool enough to pick up, put them in a food processor (or high-powered blender). Add garlic, ginger, and 2 ½ cups of vegetable broth. If necessary, divide into even batches. Puree all ingredients until the mixture is smooth. Next, pour carrot puree into a stock pot or Dutch oven. Add remaining broth, plus cumin, cinnamon, and allspice. Stir ingredients to combine and heat over medium heat. Reduce heat to low. Add heavy cream gradually. 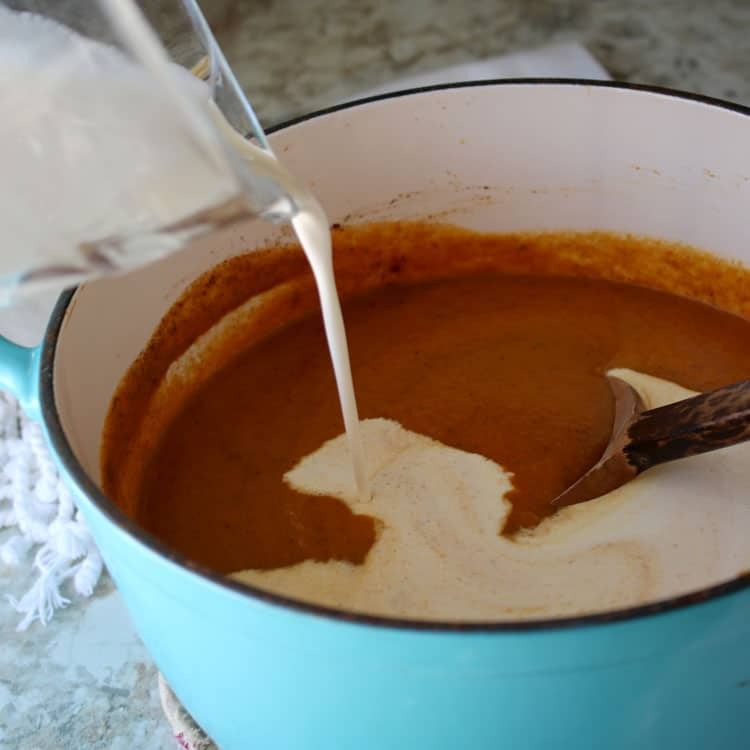 To ensure the heavy cream doesn’t curdle, make sure the cream is at room temperature or slightly warmer before adding it to the pot. Remove the soup from heat, and then season with salt and pepper to taste. Adjust other seasonings if desired. Serve immediately with a salad or your favorite crusty bread.